I've now been sick for a week solid, it's getting old! 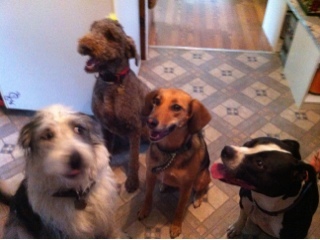 Speaking of getting old - right before I got this stupid summer cold we had the poodles birthday party! It was cute (smaller than ever before owing to the rain and I uninvited most if the dogs since the party would be IN my house) but still a nice day and I think mr man was happy! My niece blew out the candle for him!!! The nursing home we volunteer at had a party for him as well... All the cute old people sang! It was great! 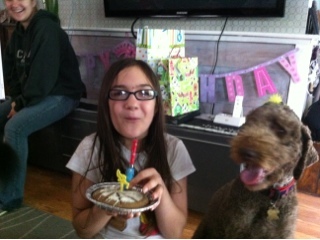 Do you celebrate your pets birthday? Or have any home remedies that work for summer sickness??? We don't know when Boomer's birthday really is, so we honor his adoption date - or as I call it, his dogiversary. Sorry to hear you are still sick. Ginger is supposed to work well for sickness and nausea, and the crystallized ginger is best (and tastes nice!). I have a cat, and shame on me, we don't celebrate her birthday although we always give her presents and a stocking under the tree at Christmas!